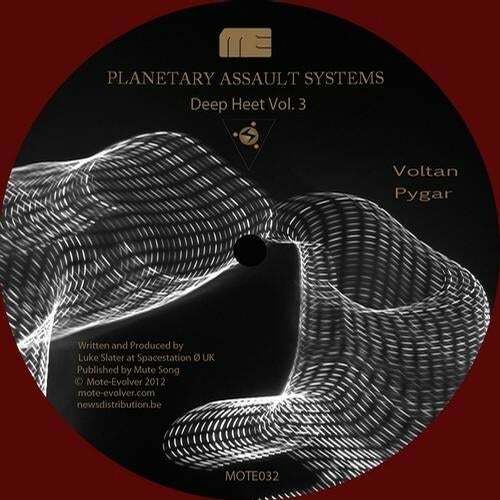 Planetary Assault Systems presents Deep Heet Volume 3, the third instalment of one of Luke Slater's most seminal series to date on Mote-Evolver and carrying on the series of intergalactic exploration.Voltan rips the EP open. Inspired by the Mayan god of drums and the earth, Voltan is underpinned by primal desires. Huge bass drives the track forward and an angry undercarriage whirls deep below. Peppered with snares and licks of white noise, the EP starts as it means to go on.Pygar's futuristic sound palette is utterly hypnotic. Loops are layered insistently and despite the 4/4 structure a disorientating soundscape emerges. Filled with sounds that could just as well have been sampled from a space station as coaxed from a synthesiser, Pygar is optimised for the chaotic afterhours.On the flip side the abstract references are abandoned in favour of the concrete. Turn erupts with syncopated rhythms, metallic rasps and mechanical warning signals. It's the stuff of industrial nightmares.Flat Tire is built on an angular bed of noise and interspersed with low, deep rumblings. The track fans outwards as ecstatic details are layered one upon another, ensuring that the EP closes on an enduringly hypnotic note.Planetary Assault Systems has created four tracks that don't play by the rules. Deep Heet Volume 3 is Luke Slater yet again innovating with four tracks that fuse together the experimental, the bold and the brutal.Josh Wink: LUKE! ROCKING IT! Turn and Flat Tire for me!Adam Beyer: amazing work, completley out there on his own, as always. been a fan for 18-19 yearsJames Ruskin: Another wicked PAS outing! 'Turn' and 'Flat Tire' stand out for meRolando: Luke is The Man!!!! Killer ep!!!! !Peter Van Hoesen: Excellent.Xhin: SolidThe Advent: PAS for president, amazing grooves from Luke.. like em allDeetron: Turn is absolutely great, love the spacey feel to it!Joseph Capriati : bomb! !Psyk: 5*. thanksAme : luke slater at his best...Mark Broom: Solid EP from P.A.S. Flat tire being my pick of the bunch:) Well done Luke!terencefixmer: Excellent of course...what else to say..Developer: rocking theseJonas Kopp: Big room techno tools , like all of them !Pfirter: Great as usual thanks Danny Howells: It's Luke Slater .. say no more. Stunning as ever.Edit-Select: Never fails,PAS Groove ..Love it xLaurent Garnier : As brilliant as ever Patrck Graeser / answer code request: Bomb!Par Grindvik: great one! love 'turn' and 'flat tire'. thanks!Mathias Woot / Krill Music: This is fkng awesome, love the entire release ! Dustin Zahn: Pygar and Turn for me. Interesting experimental take on technoDarko Esser: Luke is and always be one of the most brilliant techno producers for me personnally. This is one hell of a sonic excursion again, especially Pygar and Flat Tire make grasp for air.simply amazing! !Joell Mull : FLAT TIRE And TURN are my favorites on this Release. DJ Nori / Posivision: Turn is killa! !Tim Xavier: Excellent!!! Just the extra poison I need in my techno playlist. Highlight on "TURN"De:Bug: considering for reviewDJ Mag: niceJochen Ditschler / Groove Magazine: Luke Slater in Bestform und mit Pygar; Turn und Flat Tire der perfekte Einstieg in den Clubwinter 2012/13Tobias Quinten / FAZE Magazin: Amazing stuffDeepchild: Someone just hit me in the nuts with a full can of WIN. Turn and Flat Tire are the moody jams i need to complete my life. xEstroe: I really like 'Turn' will play at ADE :-)Dimi Angelis: WoW! great EP! Love Voltan, Turn and Flat Tire. Nice one!Billy Nasty: Great work from Luke as always! !Space DJz: lovely stuff.. full support Gary Beck: lovely lovely. flat tire is my fav but ill play them allRyan Elliott: Turn is the one for me! !Echologist / Brendon Moeller: turn & flat tire going in the bag.